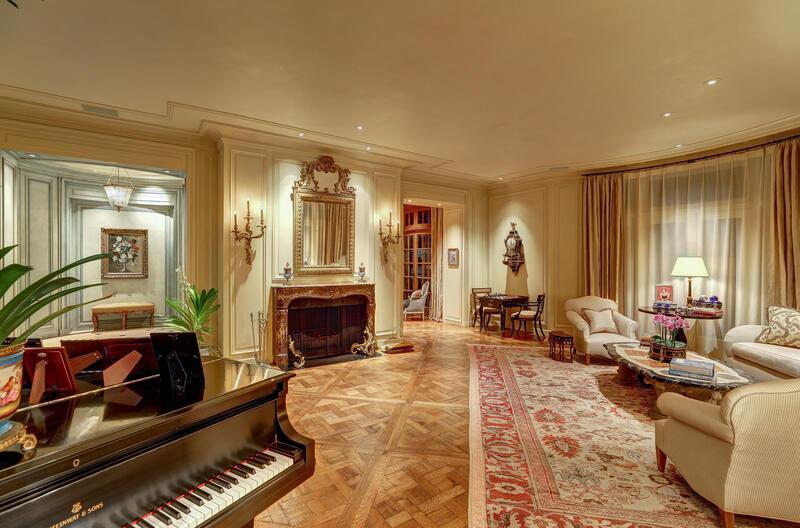 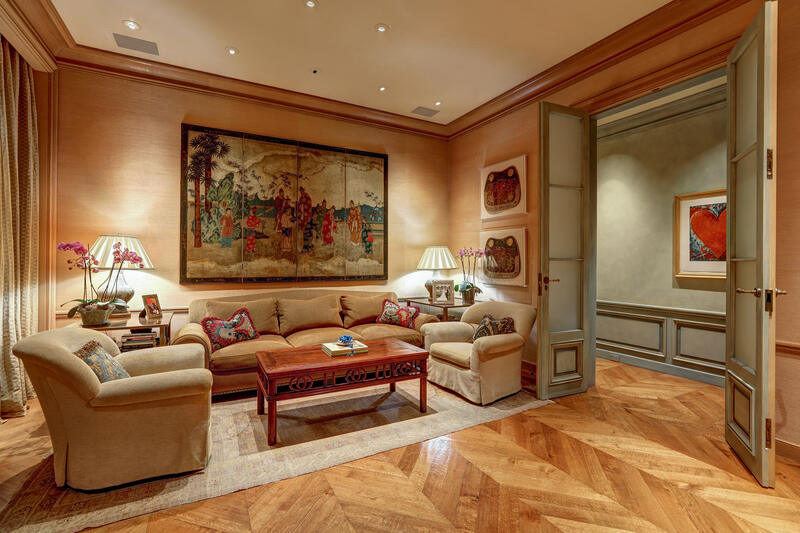 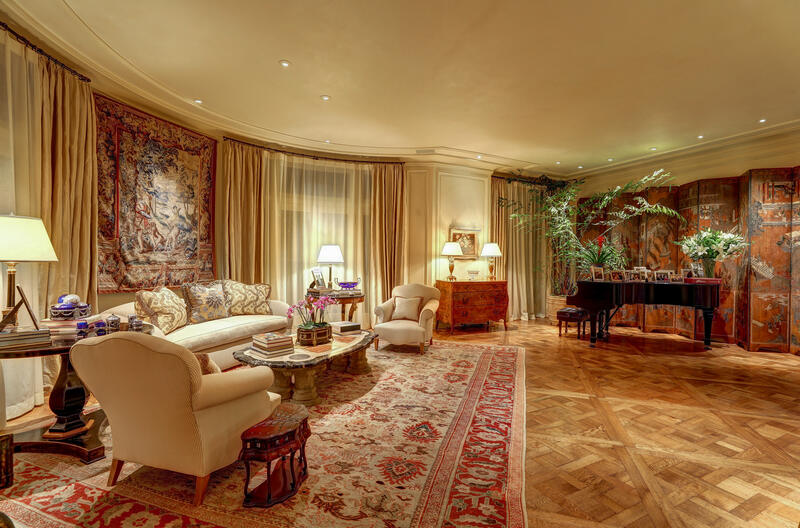 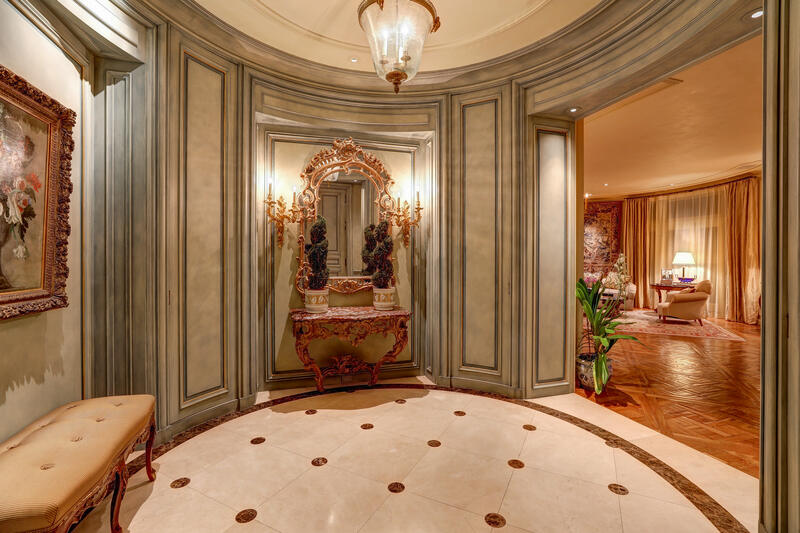 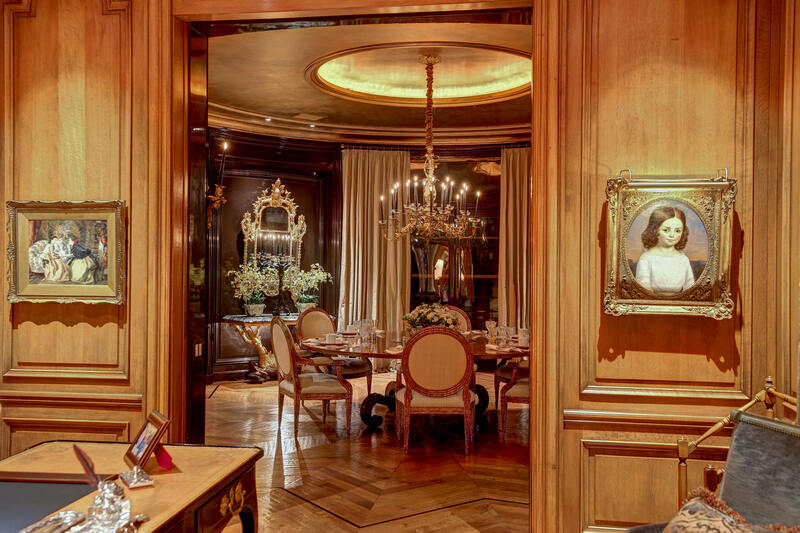 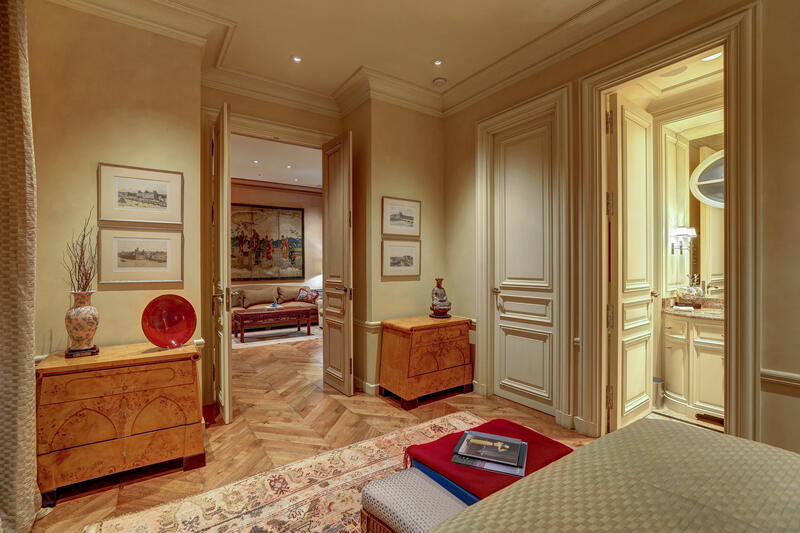 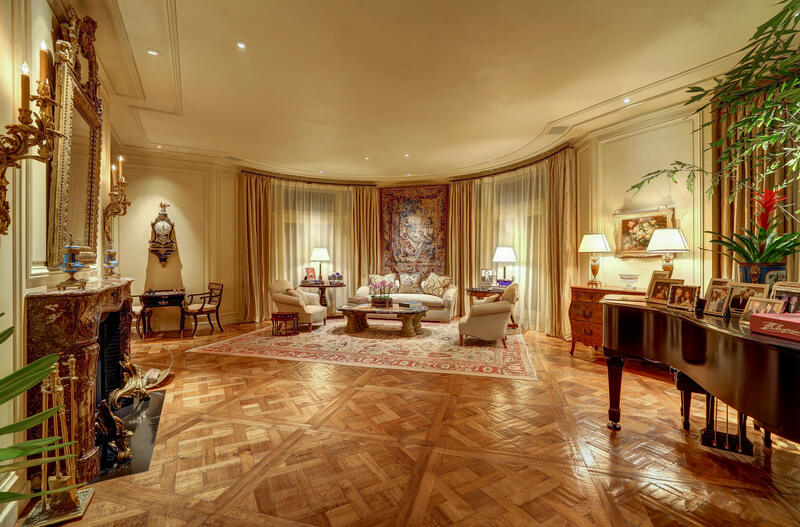 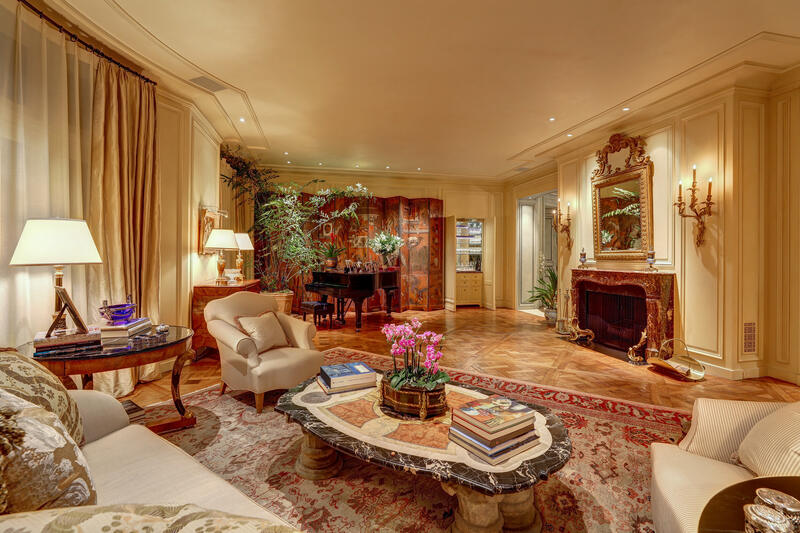 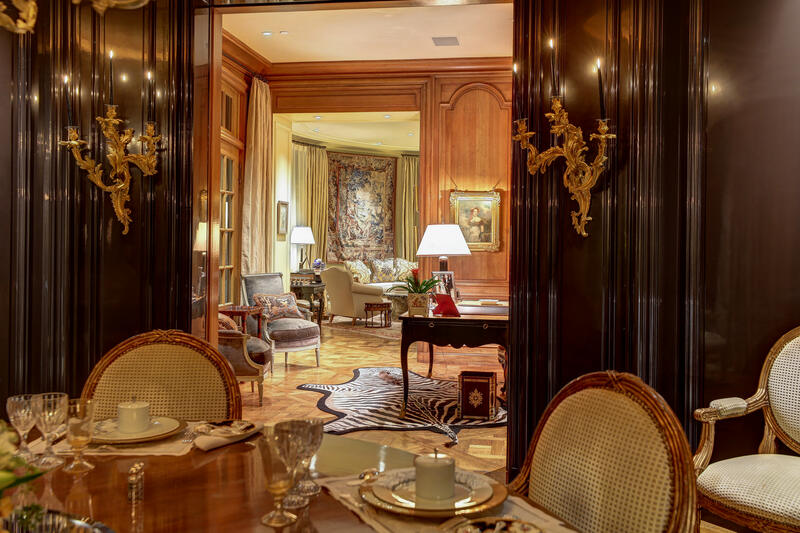 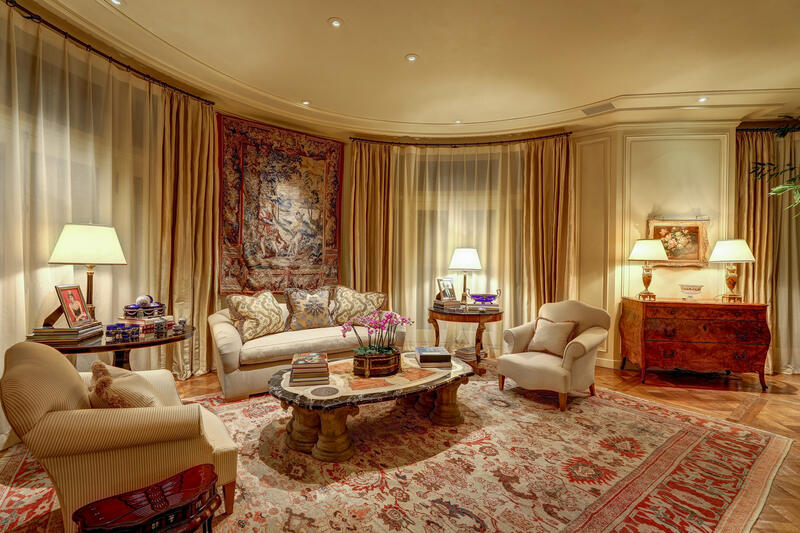 Dubbed the most elegant Parisian apartment on Nob Hill, this 3,640± sq. 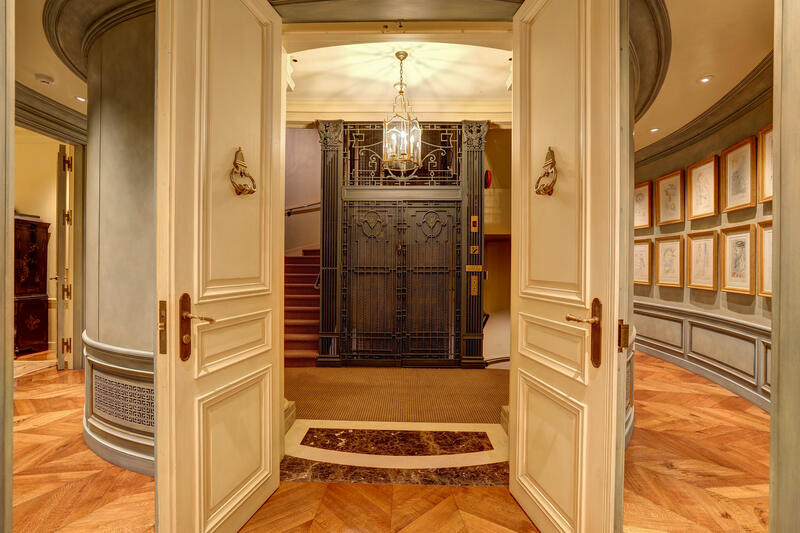 ft full-floor condo in the most iconic Beaux-Arts building in San Francisco features 2 bedrooms, 2.5 baths, a spacious living room, a formal dining room with 10-ft. high ceilings, an exquisite library/office, a sitting room adjacent to the guest bedroom, Versailles style reclaimed oak floors, French doors opening onto views of the most iconic landmarks including Grace Cathedral, the Pacific Union Club, the Mark Hopkins Hotel, the Fairmont Hotel, Huntington Park, the Bay Bridge and the Salesforce Tower. 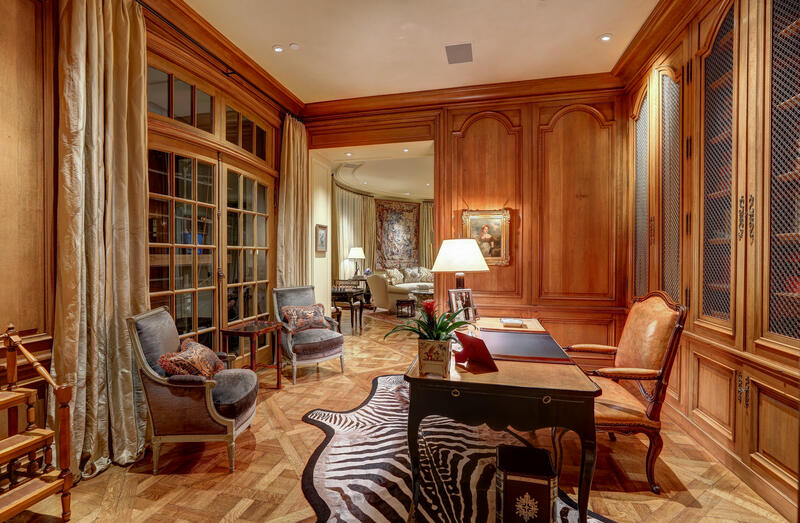 This sophisticated home was completely renovated by internationally-renowned architect Andrew Skurman and award-winning interior designer Suzanne Tucker with attention to every stylish detail, using the finest materials with no expense spared, complete with a house wide music system. 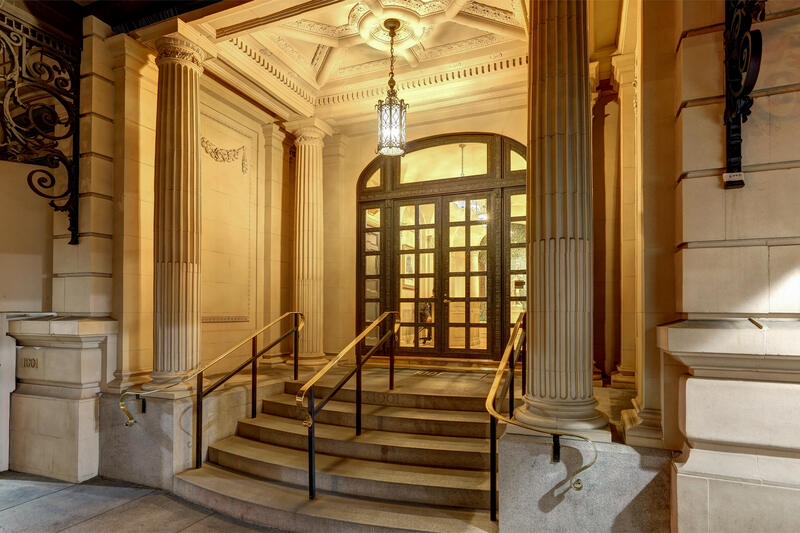 Over the past three years the entire building has undergone a complete renovation, with repairs to strengthen the building infrastructure. 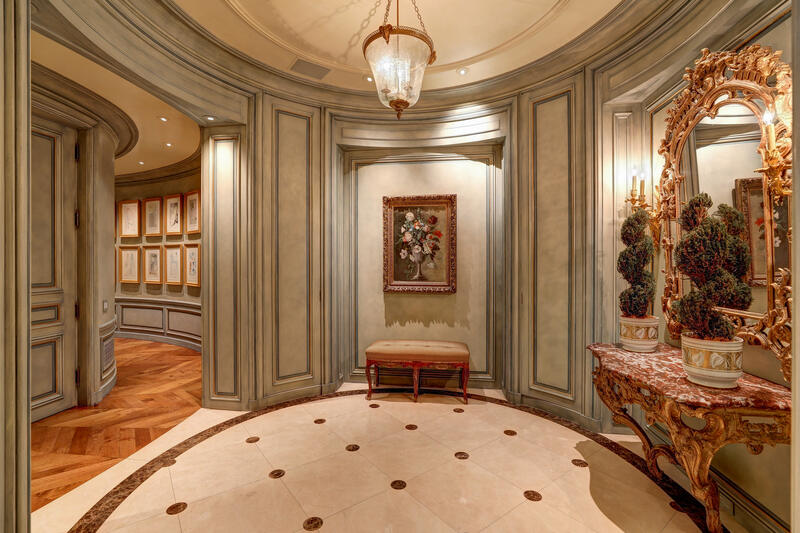 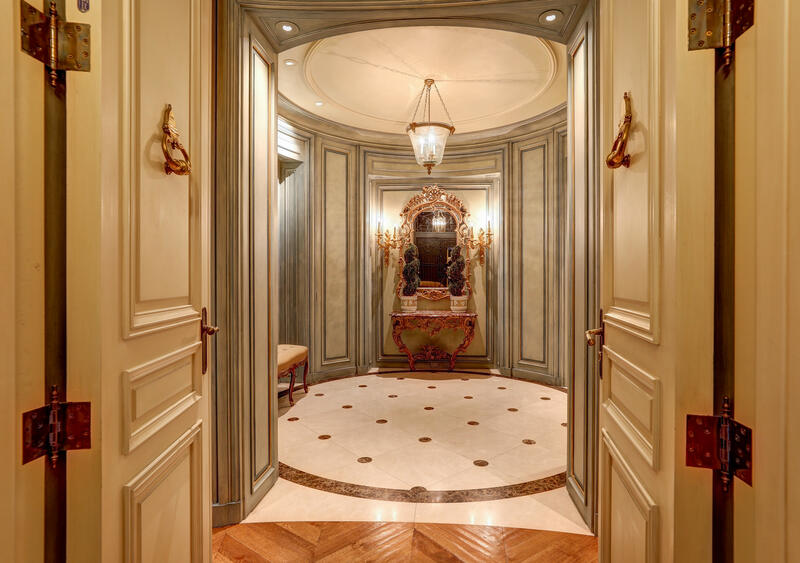 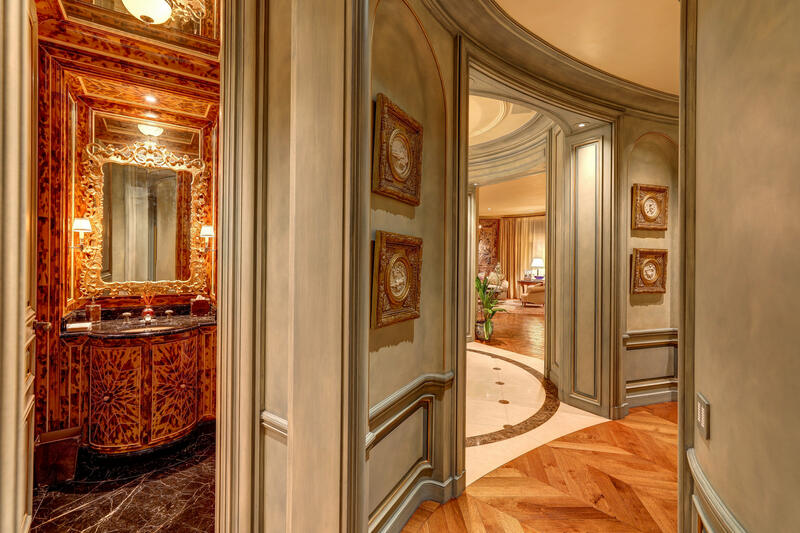 The oval-shaped dramatic entry foyer has curved panels in the shades of Versailles blue with muted gold trims on hidden cabinets, a Louis XV giltwood console with marble top and a Louis XV gilded mirror. 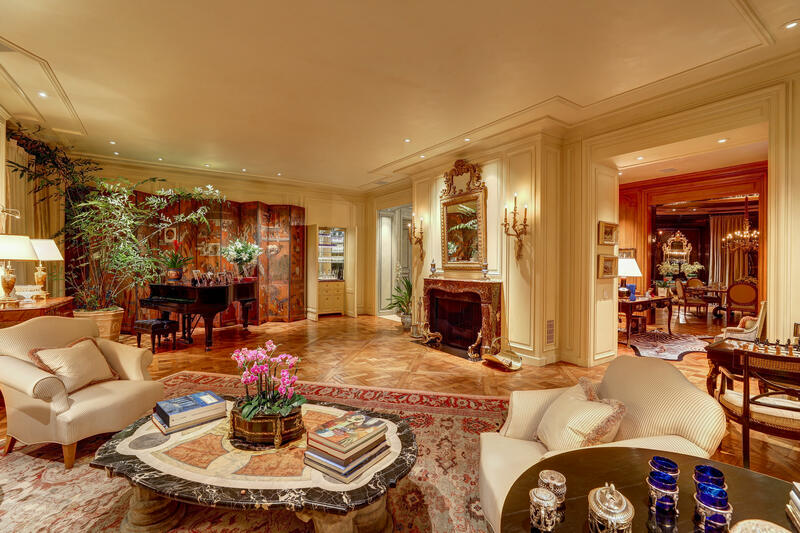 The spacious living room features an elegant mirrored wet bar, an antique French marble fireplace, curved floor-to-ceiling windows and French doors opening to balconies with wrought-iron rails, and a 12-panel antique Chinese Coromandel screen. 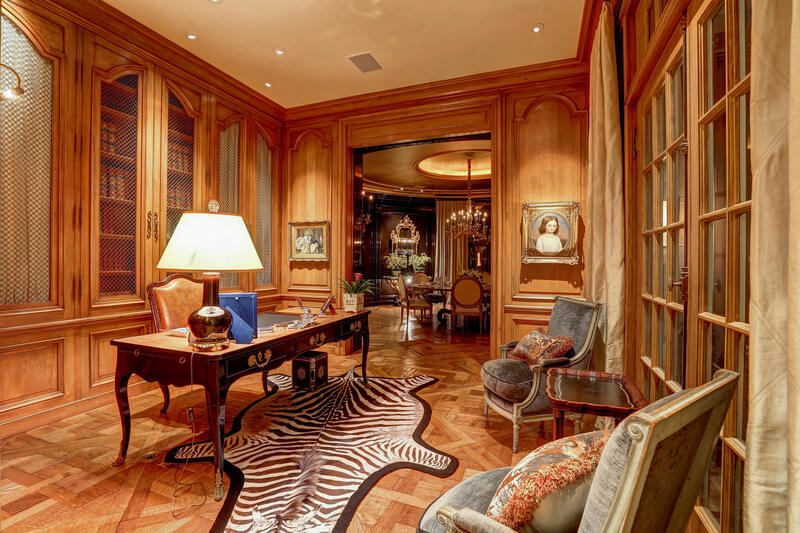 Adjacent to the living room is the Andrew Skurman designed library with hand-made cabinets and bookcases with gold wire paneled doors, a large French Louis XV black lacquered leather desk and a pair of Louis XVI bergeres. 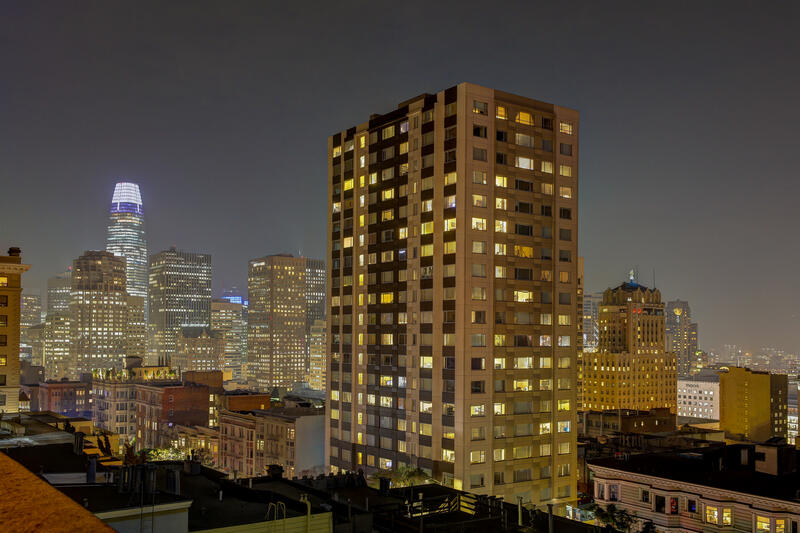 A tall French door looks out to the Bay Bridge and Mark Hopkins Hotel and other Nob Hill sights. 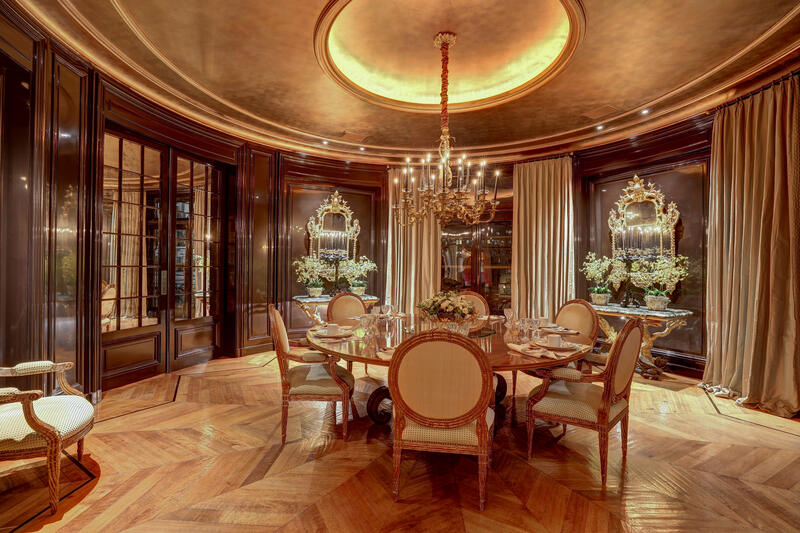 The magnificent circular dining room features richly lacquered walls, a pair of antique marble consoles flanked by 18th century mirrors and candelabras matching the sconces and the amazing antique chandelier with 24 real candles that can easily be lowered for both lighting and cleaning at the touch of a button. 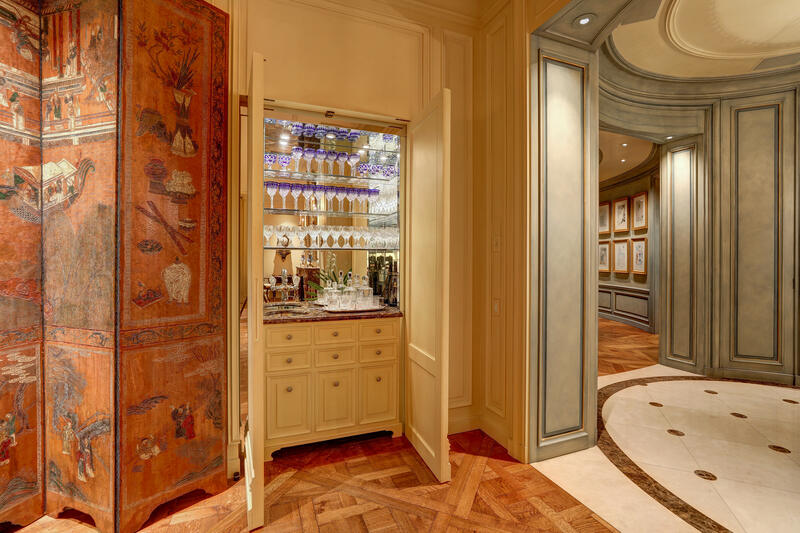 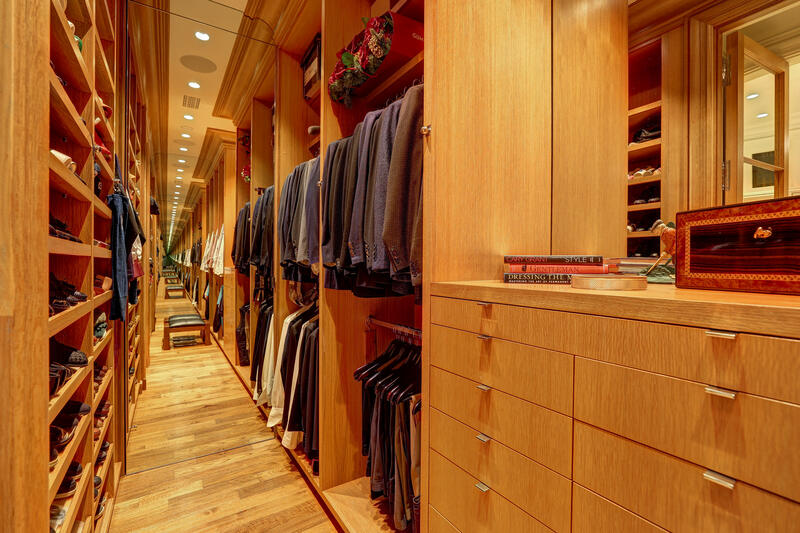 Hidden behind the exquisite lacquered wall is a secret silver closet. 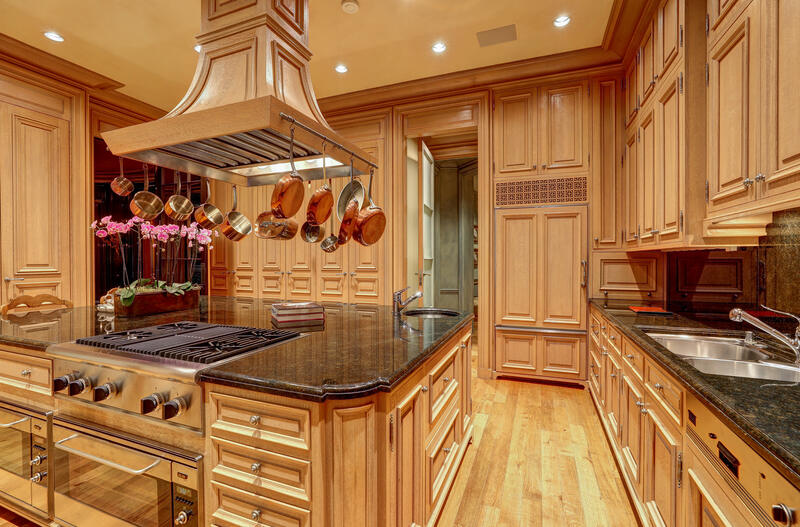 The delightful gourmet kitchen is equipped with top-of-the-line appliances fit for a three-star Michelin chef with ample cabinets, a huge granite center island concealing a water filtration system, a hood in the shape of the Eiffel Tower, a wine refrigerator, warming oven and crisper drawers. 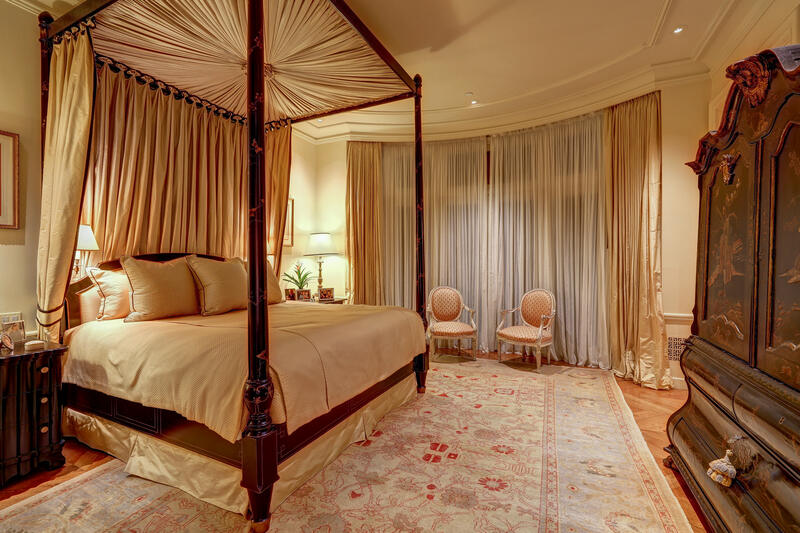 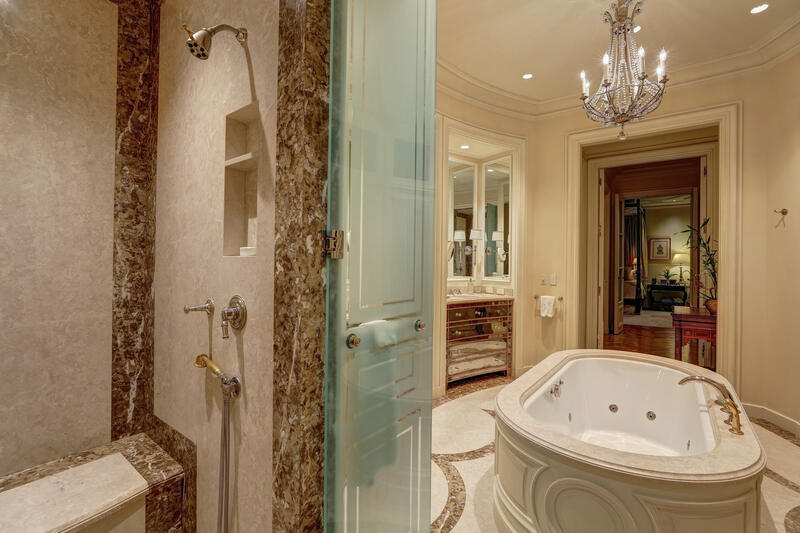 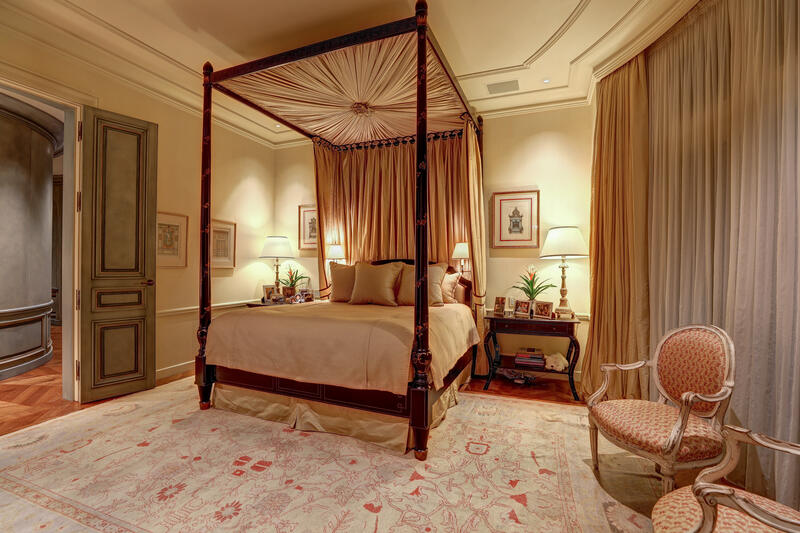 The spacious master bedroom features a luxurious spa-like bathroom with a center-piece marble tub, marble shower for two, double sinks with antique style mirrored cabinets and the finest appointed his-and-hers closets imaginable. 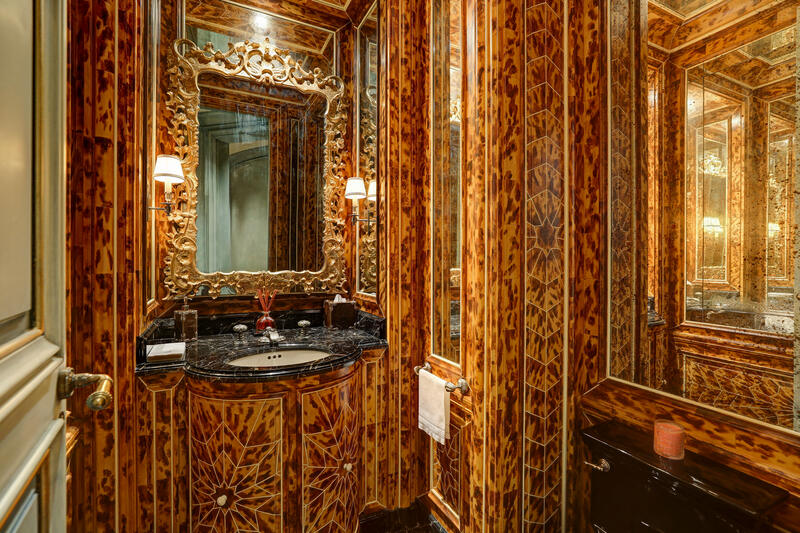 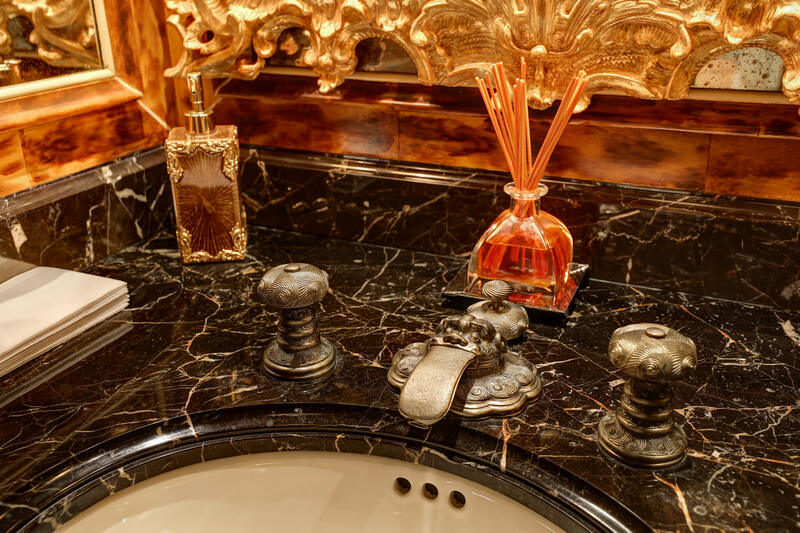 The amazing guest powder room is hand-painted by San Francisco artist Willem Racke to resemble tortoise shells, and a half-circle vanity with exquisite sink and French fixtures is completely surrounded by gorgeous antique gilded mirrors. 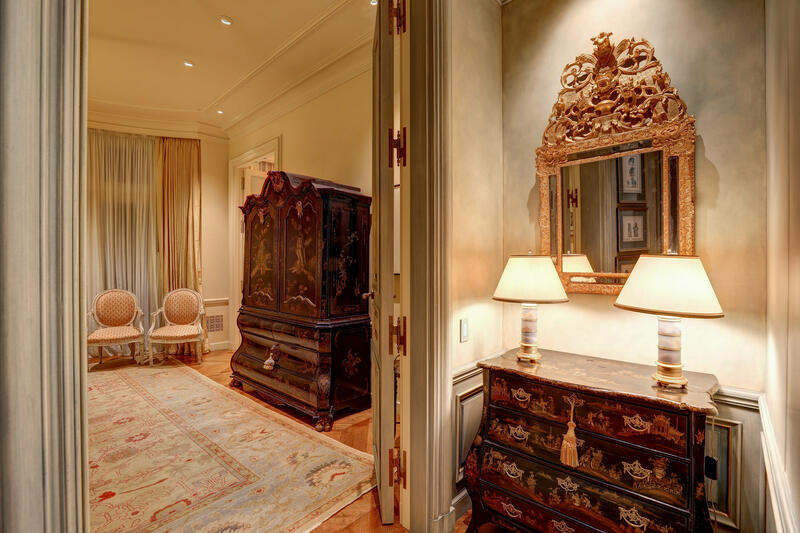 The guest bedroom suite contains a gracious sitting room with bookcases and a built-in hidden TV, and has its own full marble bathroom and walk-in closet. 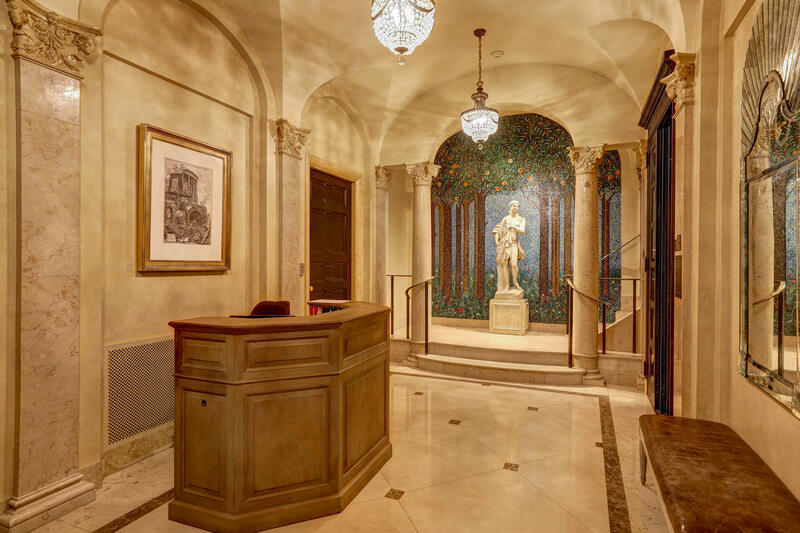 There is 24-hour doorman security in the elegant lobby with an elevator directly to this full floor condo. 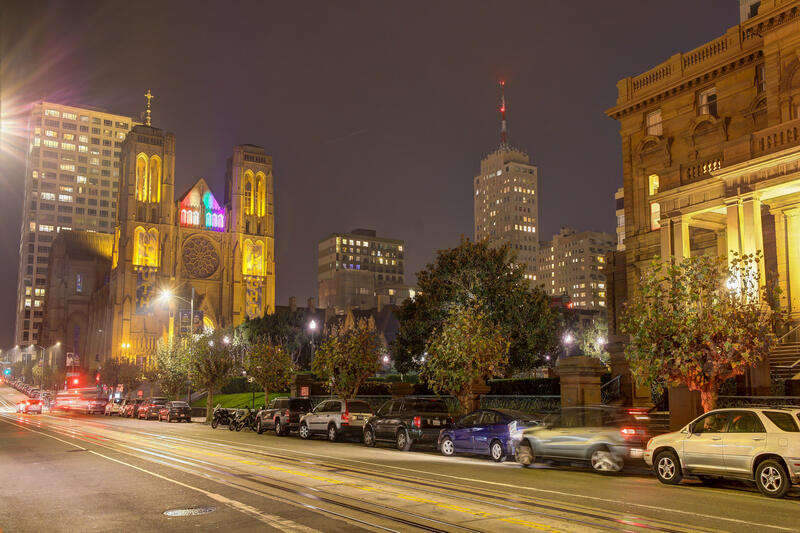 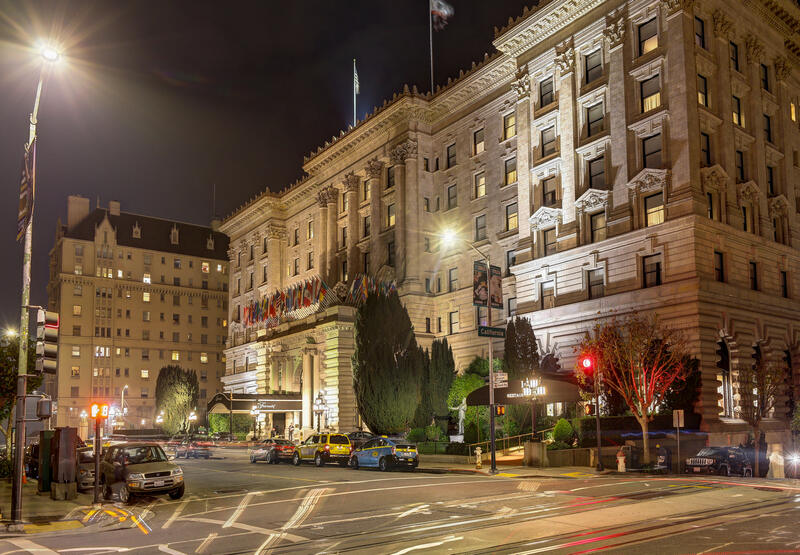 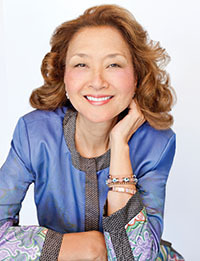 The location is within easy walking distance to all the great lifestyle amenities on Nob Hill and Union Square.